Dr. Seuss’ Birthday is March 2nd! Dr. Seuss books have been entertaining kids for years and will continue to do so for generations to come. 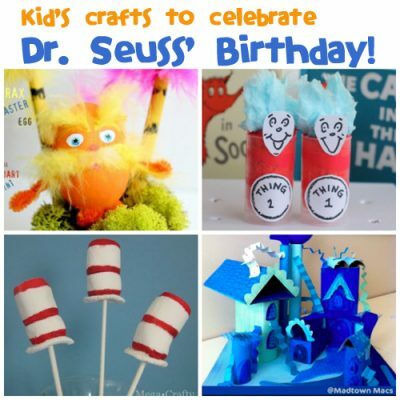 We’re continuously collecting fun Dr. Seuss crafts and recipes for kids and keeping them here for you whenever you want them, whether it’s for Dr. Seuss Day and Read Across America, or for any other day. Here are 10 of our favorites. 1. Lorax Felt Storyboard – Retell the story of the Lorax using this pretty felt storyboard. Children can also use the characters and scenery pieces to make up their own Lorax-inspired story. 2. Handprint Thing 1 and Thing 2 – Turn your handprint into Thing 1 and Thing 2 from Dr. Seuss’ classic, ‘The Cat in the Hat.’ This craft is so much fun! 3. Horton Hears a Who Craft – Change an empty cardboard tube into Horton, the beloved star of Horton Hears a Who. He has so much personality! 4. Oh, The Places You’ll Go Balloons – Create beautiful paper mache balloons inspired by ‘Oh, The Places You’ll Go!’ This fun craft has so much room for creativity. 6. Cardboard Tube Grinch – What would a Dr. Seuss round-up be without the Grinch?! While this craft is best for Christmas, we couldn’t resist including it here. Pin it for later! 7. Dr. Seuss Gift in a Jar – Any elementary teacher would love receiving this fun gift inspired by the Cat in the Hat. What’s inside the jar? Something perfect for Read Across America day! 8. Green Egg Cookies – Do you like green eggs and ham? Even if you don’t, you’ll love these easy-to-make cookies with their green candy yolks. 9. Goldfish Graphing – Sneak some math into snack time with this graphing activity, inspired by ‘One Fish Two Fish Red Fish Blue Fish.’ It’s great fun for Dr. Seuss Day. 10. Cat in the Hat Sandwich – Get creative with this edible version of Dr. Seuss’ icon, the Cat in the Hat. It’s cute and tasty, too! 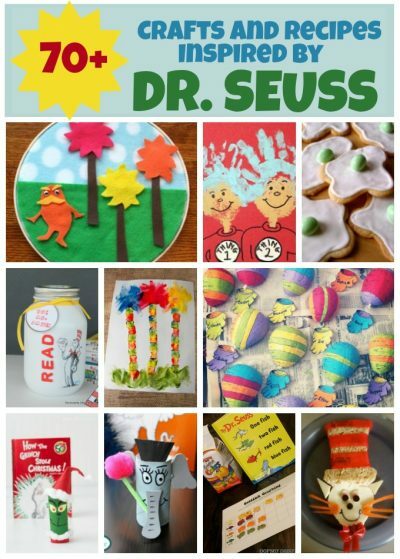 Remember to check out all 70+ crafts and recipes inspired by Dr. Seuss! Get the instructions for ––> Dr. Seuss’ Birthday is March 2nd! This great! my son love Dr. Seuss 🙂 I love the marshmallow hats.